The all new EzMate™ 601s use the same platform and software of EzMate™ 601, but have more advanced features added, such as UV lamp, HEPA filters and Active Cooling / Heating modules (ACHM). 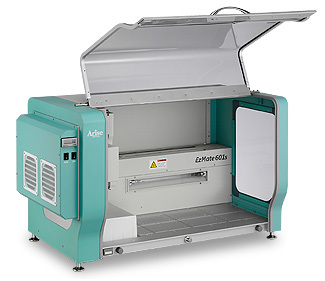 For high-contamination clinical labs and RNA experiments, the UV lamp and HEPA filter provide a clean working environment. 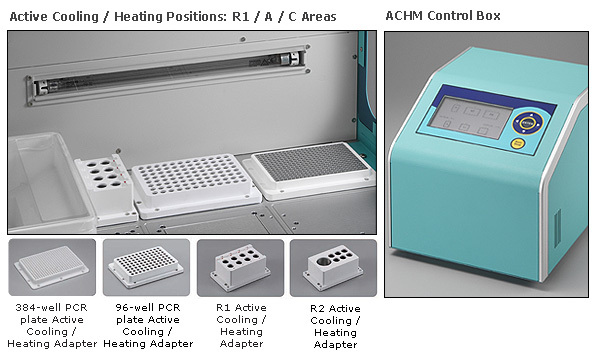 For temperature-sensitive samples and reagents, the Active Cooling / Heating module (ACHM) prevent them from degrading. The advanced design of the EzMate™ 601s delivers improved process safety, giving you peace of mind. The standard UV and HEPA modules ensure effective worktable decontamination and provide positive clean air pressure throughout PCR setup. 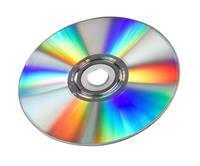 The UV safety shield provides protection to human eyes from UV light. With optional Active Cooling / Heating Module (ACHM), you can keep your precious samples and reagents cool and fresh during the experiment setup. You can also heat up your experiment mixture to speed up the reaction. 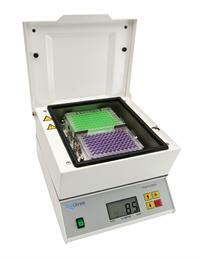 Interchangeable cooling / heating adapter allows you to adopt different types of labware. The Active Cooling / Heating Module (ACHM) includes the Active Cooling / Heating Control Box, which provides the user an interface, a power supply, and the Active Cooling / Heating Adapters.